So the Spider are in hiding. Only this time, instead of burning down the Shinomen, they'll burn everything and take over the Empire. Daigotsu and Kanpeki, the Father-Son dream team. OH I LIKE THIS! Not sure how to abuse it yet, but I'll figure something out. Scorpion get away with maho undead summoning without honor loss?? hmmmmm??? They won Onyx - shouldn't they get something out of it? I figure it's because they won the tournament, and this will probably be how the cards that come from this Kotei season will look. PS: The Scorpion previews are VERY GOOD. That 6g 4f Kensai is just stats and keywords, but it's 4f for 6g, with a madness token for whatever nonsense the Bitter Lies get up to with that. Overall, today saw a strong batch of cards. Goju Kumoru + Feign Death. He's also 0HR instead of -HR. 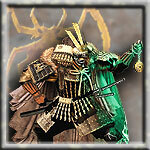 Scorpion Kensai uses the same corrupt gold Spider does, but have military guys with HR. Of course, they can acutally gain honor back from their guys but he's definitely not an early buy if you are using the corrupt gold. I actually thought of this one on the drive home from work. Oh man cant wait for the Spider previews and how relevant this might be! Either way, more zombies for my undead hoard! Thanks scorpion! Is this card dual-bugged for onyx? If so, it might/probably mean we will see the old "you do not lose honor from cards you own". At the very least, that would explain why only scorpions are mentionned. Our stuff today, around noon. Twill be interesting to see what we get. I was wondering how the Chuda would be affected by the current storyline. Guess that answers that. i am happy well in excess of the actual viability of the card to see Yajinden back. Dunno looks pretty strong. If only there were more ways to give your Spider Clan Personalities Fear actions! The only ding would be the -2 Family Honor, because it makes our auto-loss against dishonor that much faster. Otherwise, that's a good Sensei. And it dodges the -1GP kiss of death. The ding is that we still lose honor from Zenshi and Daigoro and Noekam because they're Nonhuman. I think Sam Flegal did a badass job on the artwork for Yajinden. It's a deep fav of mine.